6 October 2018. Although it is not perfectly rectangular, it is still very geometric. New photos of a surprisingly rectangular iceberg provide the complete picture of this now famous Antarctic structure – and it remains strangely like a hell. 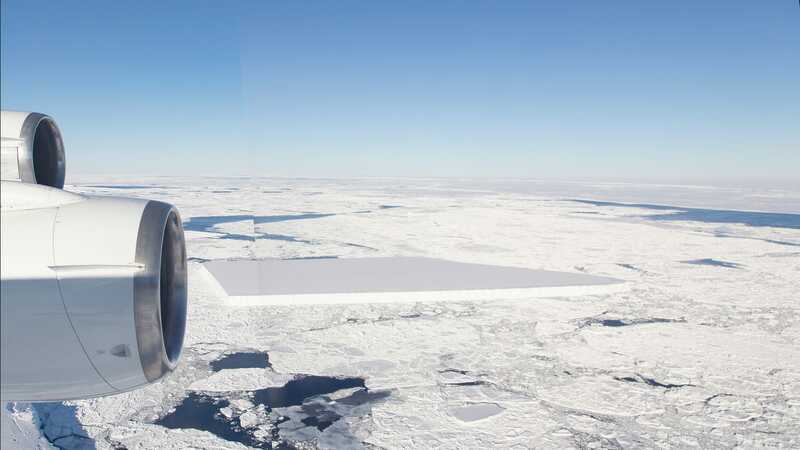 Scientists of NASA Operation IceBridge have released the original photo last week, but it only showed part of the odd iceberg. The original photo of the geometric iceberg, which triggered a tremendous global response. For much of the "mountain" out of the frame, it was not clear how geometric the whole structure really was. Now, new photos from IceBridge scientists show the true shape of the iceberg. It's not a perfect rectangle, but it's still a very square rectangle. An oblique view of the geometric iceberg. These photos were taken by IceBridge Senior Support Scientist Jeremy Harbeck discovered the Tafeleisberg near the Larsen C ice shelf. Table icebergs are the product of calving ice shelves – when large chunks of ice suddenly break loose – and they are known for their sharp-edged lines and smooth peaks. A Landsat 8 view of the geometrically unusual iceberg from outer space (see arrow in the middle left). The photo was taken on October 14, 2018, just two days before Operation IceBridge captured its now famous photo of the iceberg. "I thought it was pretty interesting," Harbeck said in a NASA statement. "I often see icebergs with relatively straight edges, but I have not seen any, with two corners at such right angles as this one." In July 2017, the Larsen C Antarctic Ice Shelf released the huge A68 iceberg, weighing about 1,000 billion tons and occupying an area about the size of the state of Delaware. Harbeck and his colleagues studied this massive structure when the geometric shape was discovered. Another rectangular iceberg discovered by the IceBridge team. Far left is the original geometric iceberg with the massive A68 Iceberg in the background. Interestingly enough, Harbeck discovered a second rectangular iceberg during the same flyby on 16 October 2018. In the photo above you can actually see three remarkable icebergs: the now famous, unusually geometric iceberg on the far left (slightly obscured by the engines of the aircraft), the new Tafeleisberg and the A68 iceberg to the horizon. Yes, it is huge that – the extent along the horizon line is a free-floating iceberg that is about 100 kilometers long and about 30 kilometers wide. Here are some other photos of Tafeleisbergen, many of which were produced by the Larsen C Ice Shelf during the A68 calving. Tabular icebergs with the massive A68 iceberg in the background. NASA's Operation IceBridge is an ongoing mission to monitor polar regions and track the planet's global climate system. It is currently undergoing a five-week iceberg survey in the northern Antarctic Peninsula, a mission to be completed on 18 November. There is still plenty of time left for the project, so hopefully scientists will discover more Antarctic anomalies.